Poster featuring an illustration of Columbia, who is brandishing a sword and protecting a young woman sitting beside her holding onto her legs. A flag is wrapped around them, and a shield with the flags of the Allied powers is behind the sword. 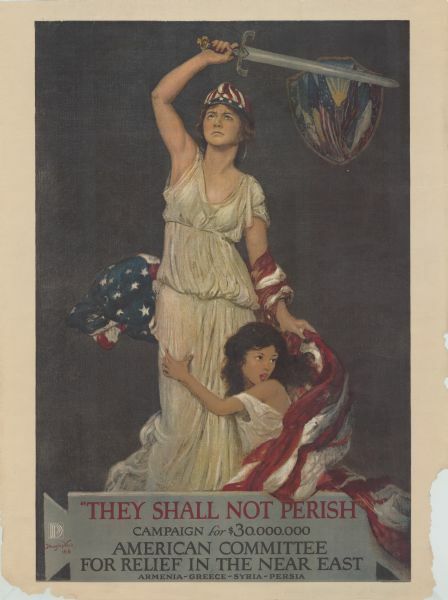 Poster text reads: "They Shall Not Perish. Campaign For $30,000,000. American Committee for Relief in the Near East. Armenia — Greece — Syria — Persia." Illustration by Douglas Volk. American Lithographic Co. N.Y. Includes the the Division of Pictorial Publicity (DPP) logo.